A portent of spring, asparagus is certainly a welcome sight when it makes its first appearance at local farmers markets in April. But our jubilation can’t match the excitement in Europe, one of several areas where asparagus is native. Some towns throw festivals in celebration when the shoots come in. There, white asparagus is king. It’s grown under mounds of dirt, rather than allowing the spears to reach toward the sun for chlorophyll. Yet the greens are packed with vitamins A, C, E, and B-complex, as well as potassium, zinc, and folic acid. Locally, Cane Creek Asparagus & Company in Fairview grows the tender purple variety. “We eat asparagus raw in the field and any way you can think to cook it,” says co-owner Glenda Ploeger. She suggests steaming the stalks, or roasting them to bring out the natural sweetness. She also likes to use asparagus in stir-fries. 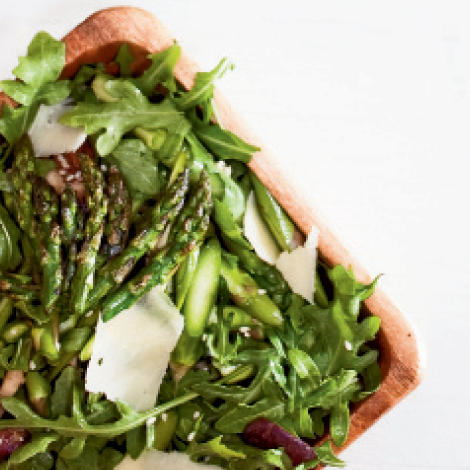 Sarah Zell, executive chef at Snowbird Mountain Lodge in Robbinsville, shares a simple recipe, which uses garden-fresh greens and sautéed and raw asparagus with a few key ingredients that complement the subtle flavor of the spears.